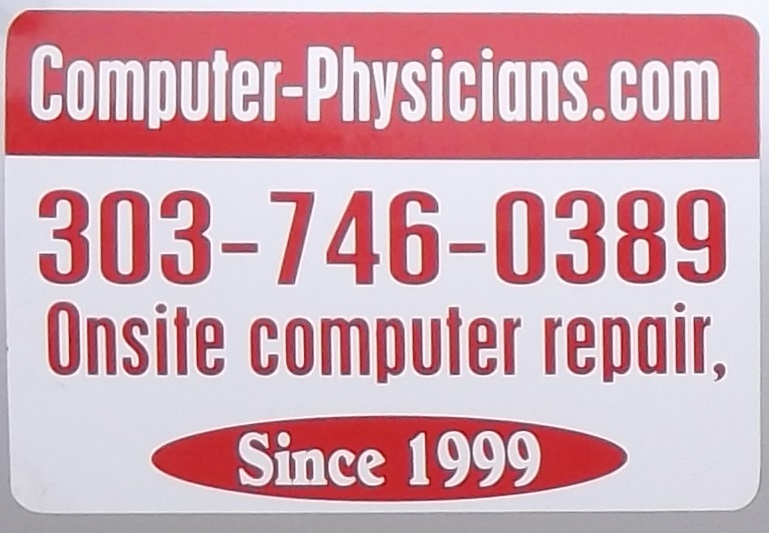 Computer Physicians, LLC Colorado customers frequently ask many questions about their computers. Therefore we have created a blog to help customers understand some topics in the computer and internet world. What are the Benefits of Computer Networking with Computer Physicians? The most obvious benefit of computer networking is that you can store virtually any kind of information at, and retrieve it from, a central location on the network as well as access it from any connected computer. You can store, retrieve, and modify textual information such as letters and contracts, audio information such as voice messages, and visual images such as facsimiles, photographs, and even video segments. A network also enables you to combine the power and capabilities of diverse equipment and to provide a collaborative medium to combine the skills of different people—regardless of physical location. Computer networking enables people to share information and ideas easily, so they can work more efficiently and productively. Networks also improve commercial activities such as purchasing, selling, and customer service. Networks are making traditional business processes more efficient, more manageable, and less expensive. By networking your business computers you can reduce the amount of money you spend on hardware by sharing components and peripherals while also reducing the amount of time you spend managing your computer system. Equipment sharing is extremely beneficial: when you share resources, you can buy equipment with features that you would not otherwise be able to afford as well as utilize the full potential of that equipment on your network. A properly designed network can result in both lower equipment costs and increased productivity. Suppose that you had a number of unconnected computers. Employees using these computers would not be able to print unless you purchased a printer for each computer or unless users manually transferred files to computers with printers. In this scenario you would be choosing between hardware and labor expenses. Networking the computers would give you other alternatives. Because all users could share any networked printer, you would not need to buy a printer for every computer. As a result, instead of buying numerous inexpensive, low-end printers that would sit idle most of the time, you could buy a few inexpensive printers and a few printers with high-end productivity features. The more powerful printers would be able to print more rapidly and with better quality than the less expensive ones. In addition, the more powerful printers might also be able to print in color and to sort, staple, or bind documents. When you select the right mix of printers and assign each network user appropriate access to them, you have enough printing power to address the needs of all of your employees. Rather than leave expensive equipment idle, you provide your employees with the latest, most powerful productivity features—all for a significantly lower cost than if you were to purchase an inexpensive printer for each workstation on the network. A network enables you to share any networkable equipment and realize the same benefits that you would enjoy from sharing printers. On a network, you can share e-mail systems, modems, facsimile machines, data storage devices such as hard disks and CD-ROM drives, data backup devices such as tape drives, and all network-enabled software. When you compare the costs associated with sharing these resources to the costs of purchasing them for each computer, the savings can be enormous. A network also enables you to save money on software. Instead of buying separate copies of the same application for various machines, you can purchase one copy with enough user licenses for your network. In large businesses the amount of money saved on software is substantial. Finally, you will also be able to reduce your administrative overhead. On a computer network, updates to software, changes in user information, and network security can all be accomplished from one location. With standalone computers you would be required to make these updates on each individual computer workstation.